So I'm here today to chat about my new planner I picked up from Kikki K and I haven't been so excited about a planner for such a long time so let's get into it. So first off I need to apologize for the fact of how bright this picture is - Lighting was horrendous when I took these pictures so I do apologise but this was the best picture I could find. So I also didn't take a picture of the inside of the planner (Stupid Megan!) So I can only really talk about the planner itself but the inside is just so lovely as the colour scheme is mainly grey, white and lilac which I think just goes perfect together and adds a nice touch to the planner. The only downside is the ringbinder is white on the inside which I would of prefered the rose gold as I think it would of matched perfectly - Only the downside I have on this planner which is good. 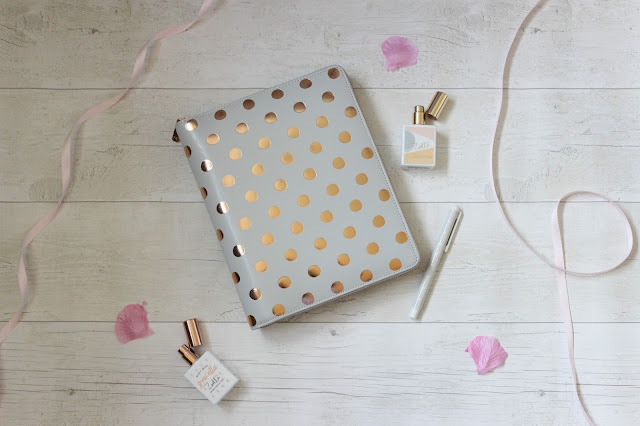 So the outside is a lovely grey leather feel with a rose gold zip and rose gold spots on the front which I think the planner is just lovely to look at which is why I was so drawn to it. I had been looking at this planner for a few months and when I checked recently it had been reduced which is always a bonus which is actually why I picked this up. So I use A5 planners as that size is the perfect one for me and I prefer to have an A5 size of paper to write my to-do list down etc rather than a personal sized one so for me the A5 planners are perfect. I just love Kikki K planners as I think they are all just such lovely and cute planners but this was definitely one of my favourites with the zip as it keeps everything in one place and I know I won't lose anything from my planner, The downside of the Kikki K planners are they can be quite expensive but as I said I got this when it had been reduced so I didn't pay the full price which is always nice. I feel as though I've rambled enough about the planner but will definitely be adding it into more of my pictures etc. I'm a lover of stationery and planners are a must for me which this one is more of a daily/weekly planner whereas my Kate Spade one I showed you recently is more of my monthly planner as it's a little too heavy to be carrying everyday whereas this one is perfect. I am going to start adding more stationery posts onto my blog as it's recently become something I've been buying a lot of recently. Do you own a Kikki K planner?